Airtel Money gives its users the freedom to transfer money from Airtel Money to Bank Account. Even it might be a bank holiday or non-working hours of the bank you can still transfer money from Airtel Money to Bank Account anytime and anywhere instantly. 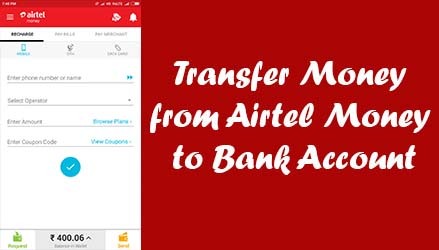 So that’s why we are here to help you out on how to Transfer Money from Airtel Money to Bank Account, below instructions which will guide you on how to successfully transfer money from your Airtel Money Account to Bank Account. First of all to be able to transfer Airtel Money to Bank Account you should have an account in Airtel Money, for that you will need to register an Airtel Money Account by installing Airtel Money App on your smartphone. And once you have installed Airtel Money App you will have to complete the necessary steps of Airtel Money Registration Process, alternatively you can also register Airtel Money Account Online by clicking here as well as you can register Airtel Money Account from your Airtel Mobile Number by simply dialing *400# and follow the steps mentioned to complete your Airtel Money Account Registration. Once you are done with Airtel Registration, on your smartphone download the Airtel Money App from your respective app store depending on your smartphone OS platform. Airtel Money App is available on almost all Smartphone Platform devices which includes Android, iOS, Windows Phone, Nokia, Blackberry, and Java Phones. Just download and install Airtel Money App on your Smartphone, and once you are done just open the Airtel Money App and sign in with your Airtel Money Account Details. 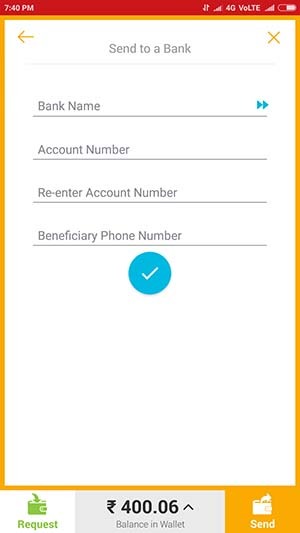 (If you had registered Airtel Money account through Airtel Money App than you will have to skip this process as you had already downloaded Airtel Money App on your Smartphone, this step is for those users who had registered Airtel Money Account Online or through Dialing USSD Code on Mobile). If you already have balance in your Airtel Money Account then you can proceed with further steps to transfer money from Airtel Money to Bank or else to be able to Transfer Money from Airtel Money to Bank Account you will need balance and for that you will have to load money by clicking on Load Money option from Airtel Money App, enter the amount which you want to load to your Airtel Money Account and proceed to next step to complete the payment via Net Banking, Visa/Master Credit Card or Visa/Master Debit Card. After successfully loading money in your Airtel Money you will be able to see the loaded money in Current Balance. The Credited amount in your Airtel Money Wallet will be available for bank transfer only after 48 hours. To Transfer Money to Bank a/ctap on Send button which you can see in home screen of the Airtel Money App. Next you will get two options Send money to Friends & People and Bank Account, you just tap on Bank Account as you want to Send Money to Bank Account. 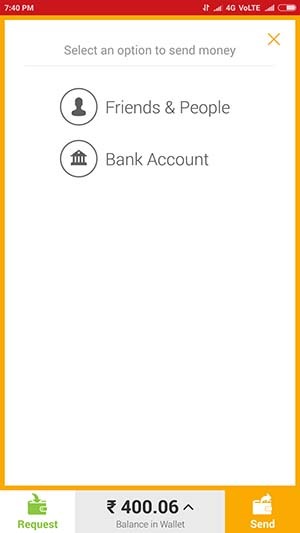 In next screen you will have to enter your Bank Account Details like Bank Name, Account Number, and Beneficiary Phone Number, once you enter these details just tap on tick mark button. Next you will have to enter the amount (how much amount do you want to transfer from your airtel money account to bank), and tap on tick mark button. 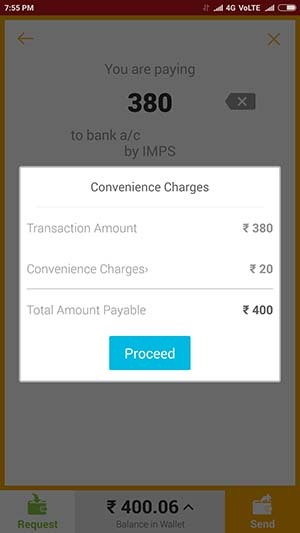 Then it will fetch convenience charges for sending the amount to the bank and the same will be displayed on next page, to proceed with the transfer you will have to tap on Proceed button. 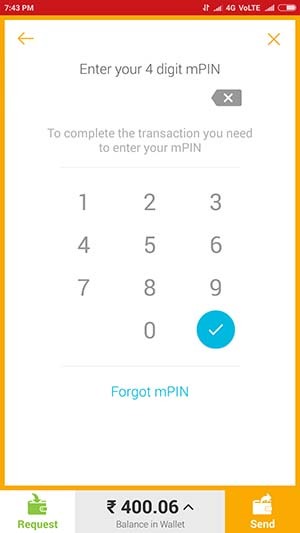 Next to initiate the transfer to bank account you will have to enter the 4 digit mPIN, just enter the mPIN and tap on tick mark button. That’s it you are done transferring money from Airtel Money App to Bank Account. 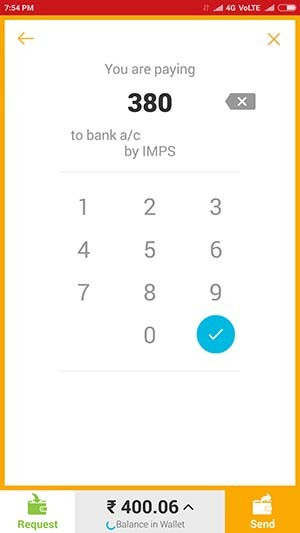 There are two types of Money Transfer available in Airtel Money one is IMPS and secondly NEFT, some banks from Airtel Money list doesn’t supports IMPS transfer so in that case the transfer will be initiated through NEFT in Airtel Money App. If money is transferred through IMPS the balance will get reelected into your bank account instantly and if transfer is done through NEFT it will take minimum 2 hours to reflect the balance into your bank account. To know the fees charged by Airtel Money to Transfer Money from Airtel Money to Bank Account click here. NOTE: With Effect from 4th November 2017, Airtel Money App has been discontinued & its services will be available on My Airtel App. To continue, download My Airtel App. I don’t see the option to transfer money from airtel money to bank account in the current my airtel app. that is December 16. Is it discontinued now? You can still Transfer Money from Airtel Money App to Bank Account. From latest version of Airtel Money app, just tap on Send > Bank Account > Enter Bank Details > Enter the amount and proceed. The amount will instantly get reflected into your bank account. Yes you can still transfer funds from your Airtel Money App to Bank. To Transfer from Airtel App Home Screen just tap on Send button, there you will find option to send money to bank account, just enter your bank details and transfer the funds. Great! I have successfully transferred money from Airtel Money to my Bank account. Thanks for sharing the guide. In Google Play Store just search for My Airtel App. I have balance but it still says amount 0 (zero) can be transferred now. Money added online can be transferred to a bank account only after 48 hours. You can transfer the credited amount to bank account after 48 hours of loading the amount in your Airtel money account. Sir,when I send money to bank,it reflect that u can send money to bank up to 0. For security reason Airtel holds the payment for 48 Hours. After 48 hours, the credited amount can be transferred to any account. What about refunds? Can those be transferred into bank account? I mean if you purchase some item on a site with airtel money & for some reason they do not ship it & it get back into airtel money.Can I transfer to my bank account? Yes you can transfer refund money from Airtel Money Wallet to your Bank Account. I am not able to transfer money its showing me that you can transfer rs.0 as of now from last 2 days and i didn’t exceed the limit what should i do?????? You will be able to transfer money to bank after 48 hours. I can’t send money to bank account. I’m trying from 2 days. Is there network issues.? ? & I need customer care number. From your Airtel Number dial 400 to talk to customer care executive. I need clarification about why I can’t transfer money. ? ? Has 48 hours been passed after adding funds or receiving funds in your account? Please do help me out ! I have transfered some amount from my credit card to my airtel account. But now i dont get any option to transfer it back to my Credit card once again. What do i do now ? and even if i try to transfer it to my bank account it show you cant proceed with the transaction. Once funds are loaded via Credit Card into Airtel Wallet/ Airtel Payments Bank you can’t transfer it back to your Credit Card, but you can always transfer the funds to your bank account at nominal cost. You will be able to transfer money to bank after 48 hours of receiving money in your Airtel Money Wallet. I am not able to transfer money its showing me that you can transfer rs.77 as of now from last 2 days and i didn’t exceed the limit what should i do?????? To transfer the available balance in Airtel Money, after adding or receiving the funds 72 hours should pass. If you don’t want such limitations to your Airtel Money Account than you can get your account upgraded to Airtel Money Savings Account. After adding funds to your Airtel Payments Bank Wallet it needs 48 hours cooling period to be able to transfer funds to bank account. I have add 5000 in my Airtel payment wallet 28-06-2017.and send money wallet to bank account but it say , No debit transactions are allowed for this account as it has been blocked. Kindly contact customer care. Please help me. Do you hold multiple accounts? Than this might be reason for suspension of your Account. You can ask your queries here, i will try to solve it in best possible manner. After adding unable to transfer. Any how Airtel charging is for fund transfer to bank. Still Airtel want to make money for 48 hours time interest??? Other apps are there to use…. For regular Airtel Wallet users there is limitation to transfer money only after 48 hours after adding it, but if you are Airtel Payments Bank Account holder then there will be no such limitations. Why can’t I transfer money from my airtel payment bank to a SBI account? Its been 2 days now. Mai sara prosses kr liya a\c m money transfer K leye pr last m -” u can send money only upto rs:0 into bank account as of now”, bta raha h jbki mery a\c m 5110 rs h, ar mai 5000 transfer krna chata hu, ap btaye Mai kaya karu …. how to refund wallet money to our bank.please guide . and why should airtel put the condition of sending wallet money to bank after 48 hours??? Effective 4th November 2017, Airtel Money App has been discontinued & its services will be available on My Airtel App. To continue, download My Airtel App. 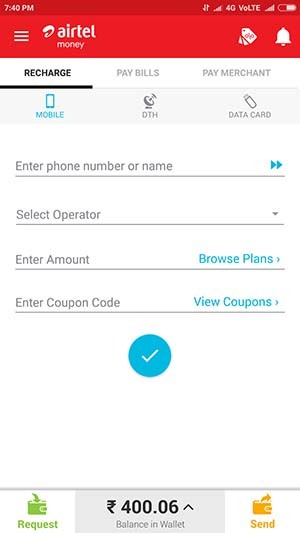 Use My Airtel App, there is no condition in that app. You will find your loaded money in My Airtel App. Just install My Airtel App and access your money there. You will be able to transfer your money from My Airtel App. I have tried a lot to transfer money from airtel money to my bank account but everytime it leaves a statement “YOU CAN SEND MONEY ONLY UPTO RS.0 IN YOUR BANK ACCOUNT AS OF NOW”. What does it mean? I can’t understand. Please tell me how to do this. W.e.f 4th November 2017, Airtel Money App has been discontinued & its services will be available on My Airtel App. To continue, download My Airtel App. Just install My Airtel App and access your money there. You can even send money from My Airtel App to bank instantly. I already have My Airtel app and I’m having trouble in the same app. Akanksha! May i know, when you had loaded or received money in your account? I think still 48 hours has not been passed from the time you have added funds in your account. So please wait until 48 hours completes. Okay then why it is saying that you can send money only upto Rs. 0 in your bank account as of now? Yes as of now you can’t withdraw balance, becoz 48 hours have still not passed. That’s the reason it is showing you can withdraw upto Rs.0/-. Once 48 hours completes you would be able to withdraw all your balance to your bank account. public money for advertisements they can at least make there users aware of the terms and conditions. It will be using their app for transfer money is last time. A message ” debit is not allowed for this account” flashes whenever i try to recharge my airtel dth through my airtel app. What could be the reason? This usually happens when they find any suspicious transaction, so as per RBI directives they will verify your account and after which your account will be unblocked. So to verify your account you will have to email them the problem with your Aadhaar and PAN Copy to [email protected]. i am unable to transfer to money from airtel payment to another bank it will shows you can send money only upto Rs. 0 in your bank account as of now. why its showing i don’t understand please explain the same. Its been 48 hours and i need the money. I’m not able to transfer it to my bank. What do i do? Hi Vijay, good to see your replies for query, so many things been cleared in entire converse, would want to know the nominal charges to transfer from airtel money to bank account. I have 5000rs in my airtel wallet and I am not able to transfer the amount to my bank ac as per the new guidelines of govt. How can i send 5000rs to my bank. It is showing you can transfer only 183rs as of now. I can’t transfer my airtel wallet balance to my linked bank account. It says service temporarily unavailable. I can’t transfer my airtel wallet balance to my linked bank account. It says service temporarily unavailable. Plese tell me how solve this problem? I am not finding any customer support number or option. 400 number not working.